The Goodbye Year: Wisdom and Culinary Therapy to Survive Your Child's Senior Year of High School (and Reclaim the You of You) is an inspirational, honest, and hilarious tale of Toni’s approach to the end of an era in the Piccinini household. The Goodbye Year is available as a print and e-book at Amazon, Barnes & Noble, IndieBound, as well as your local independent bookstore. To win a copy of The GoodbyeYear, please enter using the Rafflecopter form at the bottom of this post. The giveaway contest closes this Friday, October 11th at 12:00 AM EST. We will announce the winner the same day in the Rafflecopter widget. Good luck! WOW: Toni, You totally had me at hello! The first few lines of The Goodbye Year coupled with your fun bio information really drew me in. Your fun-loving personality shows through in everything you do. What is your key to being eternally optimistic? Toni: I've tried the other way—worrying, landing on the worst case scenario, worrying some more—and try as I did (because I thought there was some nobility for a mom to worry) I realized that it's just not me. That's not saying that I don't occasionally get caught up in the growing pains my children are experiencing, but after three Goodbye Years, my Awareness muscle is stronger. Worry, dread, and pessimism are powerless positions and they are without faith. I talk a bit about faith in the December chapter and I always get back to a sentiment that makes me feel better: "If you're gonna pray, don't worry. If you're gonna worry, don't bother praying!" WOW: That is so true—we can really do ourselves a disservice by worrying. It’s just not healthy emotionally or physically. I love your sentiment, thanks for sharing! The name of your Restaurant was Mescolanza and the name of your cooking class business is La Cucina Semplice (pronounced: la koo-chee-na sem-plee-chay) I found out that Mescolanza translates to "a little bit of this and a little bit of that" and La Cucina Smeplice translates to “the simple kitchen.” Where did you get the idea for these names and who was the biggest supporter of your culinary adventures? Toni: My husband, Jeff, and I have similar backgrounds. Italian fathers and American mothers. Both of us grew up around food and Italian culture. When I was expecting our first child, Page, we opened Mescolanza. What is it about pregnancy that makes us feel like moving house, taking on a huge assignment, or opening a restaurant? ;-) Anyway the name, Mescolanza, resonated with us as life is not always one thing (Thank God!) and "a little bit of this and a little bit of that" really defined our approach to our lives. After we sold the restaurant to have the family life we wanted for our, by that time, three children, food was still front and center in my life. I noticed that when my mom pals would stop by for a glass of wine before the dinner hour they were often amazed that what I was cooking was so simple. Simplicity is the essence of Italian food and I wanted to teach this to my fellow moms. WOW: I can agree with you about cooking while pregnant, but I just don’t know where you find the energy. I’m amazed…here I am 39 weeks pregnant and the thought of emptying the dishwasher seems more difficult than mountain climbing and here you were opening a restaurant. You really are my idol! I imagine you are a master of time management. Where do you find time for writing, cooking, and running a successful business? Toni: Well, Crystal, I have a big confession to make. I'm the shits at time management. There is a running joke in my family that I wait till the last minute to do just about everything. I used to make myself bad because I function this way, but the realization that I wouldn't judge another mom as harshly as I was judging myself was expansive. And nothing works like a deadline! WOW: Toni, thank you for your honesty, but you seemed to do just fine with the details of your tour, so thank you for making this WOW! blog tour easy for me! Can you share a recipe with us? Something specifically catered to busy moms who love food but don’t have a lot of time for food preparation. Maybe a favorite at your house as your three were growing up. Toni: Yes! Pastina. This recipe comes from the January chapter: Diets and Denial. I noticed how much my mom friends were beating themselves up over the collection of a few holiday pounds. Pastina is a simple broth, pasta, eggs, and parmigiana. Pastina is the remedy for a cold, the remedy for the feeling that you might be getting a cold, and the remedy for the ill-formed wish that you had a cold so you could stay in bed with a book and ignore the laundry. Pastina is the perfect dish to prepare when you come home from work wet and tired and don’t want to go out. Pastina makes the fastest bowl of comfort to soothe a broken heart. I’ve fed it to the boys when they’ve lost a play-off game, I’ve fed it to Page when she didn’t even get an honorable mention at the speech contest (both years), and I’ve eaten bowls of it when I didn’t know what to do with myself. The essential ingredients are three. Seriously, just three. So you have to make sure they are the best three you can find. One: il brodo, the broth. If you can make your own, you will always crave that flavor when you think of chicken broth, but come on—who has time to be boiling up a vat of it every other day? Sure, tossing the ingredients into the big stockpot is a nobrainer: chicken bones and skin, necks and wings, celery, carrot, onion, and parsley. But then you have to cool it, skim off the fat, strain it, pour it into storage containers, and clean up the greasy mess. There are rewards for this work. It is easy to sleep at night when you know that you have a cache of frozen broth in your basement deep freeze. But if you’re not on the peppy pills, the good news is that you can buy broth from the grocery store. Look for the organic free-range kind. Two: the pasta. So simple—buy De Cecco or Barilla pastina. Or Eduardo’s stellette. Three: the eggs. Collect them from the nests of your backyard flock of Anconas and Leghorns. Okay, buy local, freerange ones. Just don’t buy the white ones that come from the saddest locked-up chickens on the planet because they cost ten cents. They aren’t even worth the ten cents, but you and your loved ones are worth a wholesome, creamy bowl of pastina any day of the week. Pour the broth in a large saucepan and heat to boiling. Add the pasta; cook for about 6 minutes, then lower the heat to the lowest setting. Whip up three beautiful yellow-yolked whole eggs short of a froth. Gently fold the eggs into the hot mix with a wide spatula. This will yield a custardy-pasta-chickeny-tasting pot of goodness. If you are feeling frisky, crack some green and black peppercorns or add some freshly grated parmigiana on top of each steaming bowl. WOW: Seriously, when I read the name of the recipe I was thinking there would be at least 5 ingredients I had never even heard of, and here it’s easier than making waffles. You never cease to amaze me! I love how you give back. I’d like to hear more about how one hundred pounds of pasta was awarded in your name to the San Francisco Food Bank. Can you tell us the story behind that honor? Toni: Often I try to change a heavy calorie-laden Italian classic dish into something healthy enough for every day. Golden Grain was working with a health initiative and challenged chefs to lighten up. I made stuffed shells with whipped ricotta and tons of spinach topped off with a fresh tomato sauce. The judges loved it and I was honored to stand in the warehouse of the San Francisco Food Bank and watch the pallet of pasta delivered. I am passionate about food and feeding people. I belong to Slow Food, an international organization whose mission is to work for good, fair food for all. WOW: Toni, I’m going to be turning to you in a few weeks when I’m trying to lose some of this baby weight—so keep in mind that this girl loves to eat! In your biography you mention you are working on another book. Most of us juggle the ‘wearing of different hats’ in our lives, and you seem to do it all quite gracefully. What is the key for maintaining balance and staying motivated? Toni: Thank you, Crystal for the compliment, but I'm not doing anything different than any other moms from coast to coast are doing. We don't give ourselves enough credit for all we do because it becomes second nature. I don't think society places as much value on motherhood as we should. I remember a day I was lamenting to another mom that I "wasn't getting enough done." She suggested that I write down all that I had done that morning. Well, you're a mom—you can imagine the list! And as the years have passed, I've let some things go to create a space for my thoughts which translates to writing time. Even twenty minutes of journal writing first thing in the morning is magical. WOW: Now I can really tell your children are older than mine, because I’ll settle for two minutes and can’t remember the last time I had twenty minutes to myself…sounds dreamy though! With the children out of the house have you done anything interesting with their rooms? Toni: Jeff has taken over the boys' room. We call it The Man Cave. Page's former room is my office and guest room. When Spring Break rolls around we're kicked out which is just fine for both of us. Having a house full of "children" is a joy. WOW: I must commend you though—it seems you relate with moms at all stages. I’m decorating nurseries while you are creating man caves and yet I feel we understand one another oh too well! You really are great at connecting with readers as well as humans in general. When you aren’t cooking or writing what might we find you doing? I’ve heard you might do a bit of gardening? Anything else? Toni: I'm crazy for singles tennis. After all these years, I'm still not very good, but so what! Tennis has taught me that you can love something even if you're not holding goals for improvement. Like a labrador, I just love to chase the ball. Also, I am blessed to live in Marin County where I bike, and hike. When I'm stuck with a writing project, I head for the hills and appreciate the miracle that is this planet. Nature is a communion of sorts for me. WOW: The next time someone asks me how to keep score in tennis I’ll be expecting a short explanation from you. I think it’s fun to watch but I can’t get the hang of how they score... Speaking of mysteries, I can’t wait to hear more about your next project—can you tell us more about the magical lump of coal? Toni: I was being a little goofy when I wrote that on the Amazon profile. The stories I wrote as a child growing up in a small Western Pennsylvania coal town always had a happy ending. Magic featured prominently. And I realize that the story I'm working on right now, "Bending Glass" offers the protagonist, a mom, a chance to go back in time and change things is informed by those early memories of hearing reindeers prancing on my roof on Christmas Eve. Thank you so much for this interview. I've enjoyed out time together! WOW: You’ve enjoyed our time together? You beat me to the punch on that one! I had the opportunity to read a fabulous book, test out some new recipes, AND I’ve made a new friend. I hope you’ll keep in touch with us here at WOW! so we can be a part of your future projects as well because the pleasure has been all mine Toni! 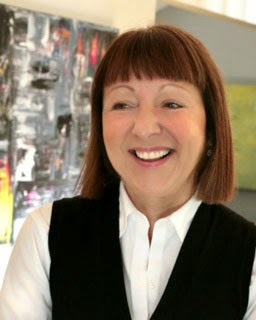 Toni Piccinini and her unique book The Goodbye Year take today's spotlight at The New Book Review. Find out more about letting go from this culinary genius and mother of three. Toni speaks candidly to Kristine and readers about the process of publishing The Goodbye Year and offers tips on surviving this milestone period of parenting. Don't miss this guest blog post and book giveaway! Don't miss today's giveaway of Toni Piccinini's The Goodbye Year and read Toni's guest post titled: "Recipes to Survive Uncertain Times"
Join Toni Piccinini as she enlightens readers about "What to Expect Your Teens Last Year of High School" and provides additional insight about her highly recommended book The Goodbye Year. Toni has also graciously offered a giveaway as well - don't miss this blog stop! Monday, October 14 @ Read These Books and Use Them! Toni talks openly to Margo's readers about "Mothering Teens" and offers a giveaway copy of her engaging book The Goodbye Year. Find out more about the intriguing and multi-talented Toni Piccinini in her candid interview with Jodi Webb and get entered into the giveaway for The Goodbye Year with is a must read book for parents (especially those who love cooking or eating good food)! Don't miss the giveaway for The Goodbye Year and a guest post by author, Toni Piccinini as she provides insight into "How to Rediscover Oneself Again After Kids Leave Home." Toni Piccinini stops at Memoir Writer's Journey and shares her thoughts on a surprise topic as well as offering a giveaway about her touching memoir concerning loving, mothering, and letting go - The Goodbye Year. Toni Piccinini stops by Book Worm with a guest post and offers a giveaway of her highly acclaimed memoir The Goodbye Year! Join author, chef, and business owner Toni Piccinini as she shares a guest post "The Best Recipes for Entertaining" with Lisa M. Buske and offers a giveaway of her humorous memoir The Goodbye Year. Nichole Smith reads and reviews Toni Piccinini's humorous tale The Goodbye Year and offers a giveaway of this memorable memoir! Giveaway of Toni Piccinini's highly favored story of parenting and letting go (sort of) The Goodbye Year and guest post about "How the Goodbye Year Came to Be" and the writing process. 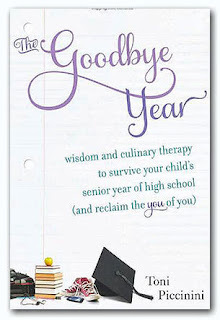 Book Giveaway Contest: Enter to win a copy of The Goodbye Year: Wisdom and Culinary Therapy to Survive Your Child's Senior Year of High School (and Reclaim the You of You), just fill out the Rafflecopter form below. We will announce the winner in the Rafflecopter widget THIS Friday, October 11th. Nice interview! I want to read the book now, and make some of the recipes! Empty nest is a very important topic. Glad to see someone taking a proactive, somewhat food-based approach to the years after child-rearing. Thanks for the fun interview. Delightful interview! The Pastina recipe is making my mouth water! :) I don't have children but several of my friends are at the stage where they could use a little help with separation as their kids are going off to college. Toni, your book would be the perfect gift for them! My kids seem to growing up so fast that I'll need this book in no time! What a great (and fun) resource for parents. I had separation anxiety when KB went to preschool this year! :) I'm excited to be on this blog tour and looking forward to the day you are on my blog! Best of luck on the entire thing and on all the cooking. This is such a great book and working with Toni is a joy - good luck with the giveaway and whether you win it or buy it, I guarantee you'll enjoy The Goodbye Year! My oldest will be a senior next year and my younger three kids are close behind him. This looks like a book I could use.